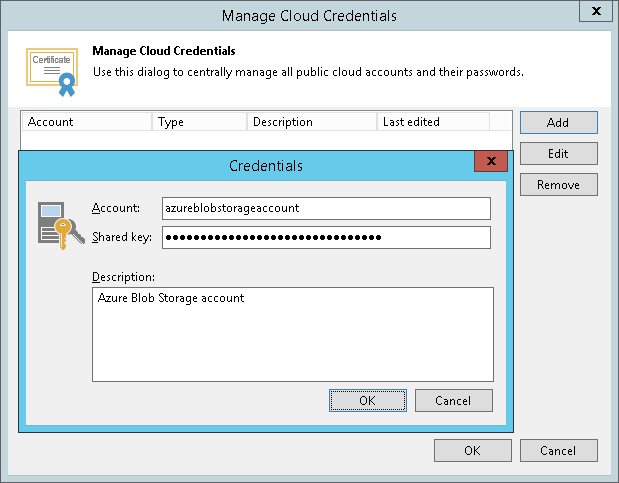 You can create a credentials record for an account that you plan to use to connect to Microsoft Azure Blob storage. The following types of storage accounts are supported. Click Add > Microsoft Azure storage account. In the Account field, enter the storage account name. In the Shared key field, enter the storage account shared key. To view the entered key, click and hold the eye icon on the right of the field. In the Description field, enter an optional description for the credentials record. If you do not have a Microsoft Azure storage account, you can create it in the Azure portal, as described in the Azure Storage Documentation.